There are some things you cannot explain. Call it a coincidence, an accident, or maybe even luck or fate. But every now and again you come across a “miracle” - a patient, who against all odds, survives and thrives even when everything was stacked against them. 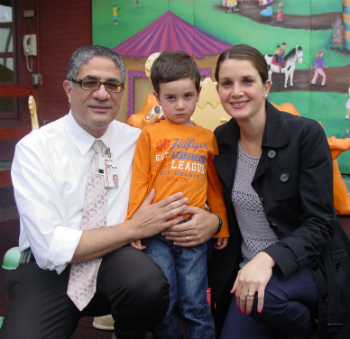 On June 4, 2013, Dr. Sherif Emil, a surgeon at the Montreal Children’s Hospital, had just begun his week on call, when he received an urgent page from the pediatric surgery fellow. The prognosis did not look good for a child in the Emergency department. Dr. Emil rushed to the crash room and found little Gabriel Kassouf surrounded by ten physicians. The three-year-old was in shock, undergoing a very difficult resuscitation by the ER and PICU doctors. His parents, Drs. Claudine Hanna and Wassim Kassouf, said Gabriel complained about some abdominal pain earlier in the day, but then began to quickly deteriorate over the course of an hour. Gabriel’s parents reached out to family and friends and their entire community came together in prayer. “We prayed as hard as we could,” says Gabriel’s mother. “I even had people come up to me in the waiting room who told me they were praying for my son.” On his walk home that evening, Dr. Emil prayed for Gabriel too. He also thought of his own daughter, Gabrielle. He couldn’t help but think of the similarities between the two children. They shared the same name and age, and yet Gabrielle was home safe in her bed, while Gabriel was fighting for his life.